It's been awhile, sorry for that. We've got a few things to get everyone caught up with regarding the band. First off, personnel changes. This is way late to announce, but we've had a change on keyboard. Though he is not a new member of Silent Old Mtns., Colin Schulzaberger is our new keyboardist. Most of you who read this, and have seen us play in the last year+, already know this. I just feel obligated to mention it. We love Colin, and he has been a part of the Mtns family for years and years. Second personnel change is our new bassist, John Fenker. Alex moved to St. Louis almost a year ago, and John joined the band at the beginning of the year. It's been great having John as part of the band, and we're excited to see what the future brings. We've been talking about a new record since we got back together in 2015, but we did actually start the damn thing. About a third of the record has been completed, with the remainder soon to follow. Thank you for your patience. We promise it will be worth the wait. Last thing I want to mention - we'll be making our first appearance at the Frederick famous Sky Stage on June 30th. 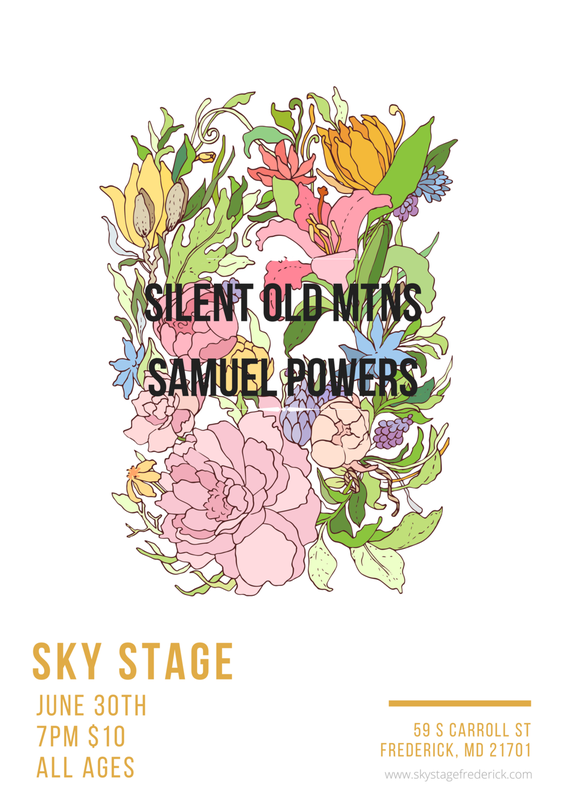 We're super excited to play at Sky Stage, and equally excited to share the stage with Samuel Powers. They're a blast. Mark your calendars. Check the poster for the show details below. That's everything for now, and hopefully there won't be a huge gap until the next update. First and most importantly, NEW MUSIC. We have been writing and demoing a new album. New songs are coming along, and if anyone witnessed our Secret Show back in December, you heard a good batch of them. You can find a short video shot by Phil Bromhal Films below showcasing some footage from that show, as well as a part of a new song recorded live. For the first time in years, we have new merchandise. Our friend, Kevin Sherry, designed an excellent tshirt for us, and it's available for purchase at our shows or in our online store HERE. We love you all, though that isn't new. I did believe that the list would be longer when I started writing, but I'm positive it will grow the further we get into 2017. Anyone who knows the MTNS, knows that we love DC9. Like, so much. We'd French Kiss that place if we could. It's one of our all time favorite venues ever, and we get to come back and play on that stage again after several years. Next Monday, August 15th, we'll be back on the DC9 stage with the super rad Gringo Star. We're excited to get to share the stage with them. It's going to be real fun, for sure. Please make sure you mark it on your calendar. What else do you have on a Monday night? Feel free to buy tickets ahead of time, or at the door, though the show might fill up fast. First off, big thanks to those friends, new and old, who came out last Sunday to Songbyrd in DC. It was real great to be back in DC, and Songbyrd was a rad spot with rad people running the place. We enjoyed ourselves. We hope to be back in DC sooner than later. This coming Saturday, July 23rd, we will be at Cafe Nola in Frederick. I don't 100% remember the last time we played Nola, but it was years ago. It's always a fun time, and we're excited to get back to one of our favorite hometown spots. Our buddies in The Milestones will be opening the night up, so come early. The first time I ever saw them was at Cafe Nola's open mic. They're good, for real. For those who have been coming out to see our shows lately, we've been adding a lot of new material to our sets. We should be debuting another brand new track on Saturday, along with other newer stuff and old goodies. We're playing in Baltimore at the wonderful Metro Gallery this coming Saturday, June 25th, and we're all sorts of excited. We'll be sharing the stage with our good buddies in Big Hoax for their debut record release. Knowing them, this record is going to be fantastic. Some other cool bands, Fellow Creatures and Pony Bones, will be playing some tunes as well. You don't want to miss it. As some of you know, the last show we played, before taking 2+ years off, was played in Baltimore. Actually, our last 2 shows were played in Baltimore. We've been looking forward to getting back to town for almost a year now, and we're excited to play a set of songs that are almost entirely unreleased new MTNS songs. We hope to see all our old pals out Saturday night to support a great night of music.